Footpatch | Pseudomedicine or Detox Breakthrough? 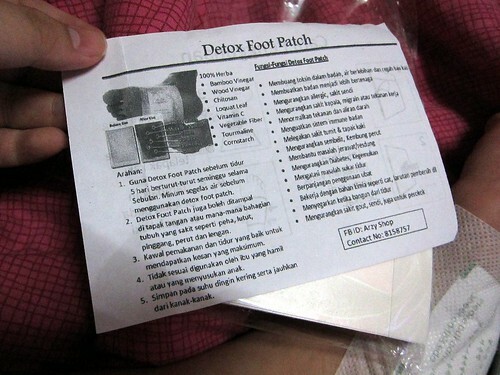 Just yesterday, I purchased a very interesting item called a Detox Foot Patch. Apparentlly it is based on the principles of reflexology and supposed to draw toxins out of your body from your well, feet. Above is what the foot patches look like when they are freshly applied on to my feets. And below is what they look like when I wake up from sleep in the morning. It’s not pretty so if you’re eating, better skip. Otherwise click click! Euuuuuuughhhh!!!! Looks like something that came out of the bowels of a wild animal!!! Hahahahah!!! It’s so cool. 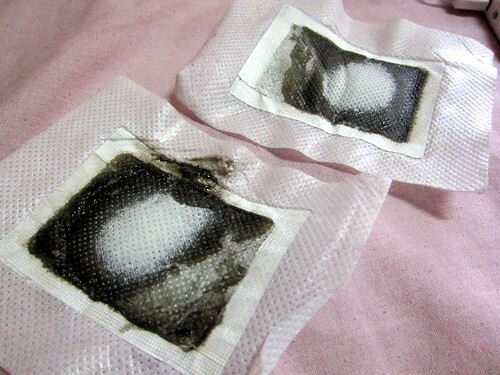 Have you guys tried this foot patch? Do you feel detoxified? Or is it just… a case of sugar pills? Either way, it’s quite fun hehe! ← Previous Post Travellogues: How much did it cost me to travel to Taiwan? I have tried these in the past – whenever I woke up in the morning, I felt as though my feet were hurting. Strange. Stopped using them because I found them too expensive. How much were the ones you bought? I bought mine for $7 per pack. Each pack contains 10 if I’m not mistaken. So it was not too expensive. But I did not feel any pain, just thought my feet felt a bit panas cause it’s all wrapped up hehe. Anyway how much were urs? Where to get those stuffs? I’m curious now! Awu, dimana ko bali? Macam aku mau mencuba! The biologist in me say ‘pseudoscience’ because skin is a semi-permeable membrane, which means it only draws out water, salt, and other stuff in your sweat, and the liver is the organ which detoxifies any toxins that enters our body. The alternative medicine user in me say, well, if it makes you feel better, why not try? I tried it udah jua though, but only once, so I couldn’t really tell the difference.